1Preheat the oven to 375°F. In a small bowl, stir together the nuts, sugar and spices. 2Make sure your phyllo is completely thawed, and keep it covered with a tea towel or piece of plastic wrap to keep them from drying out. Place 2 sheets of phyllo on the bottom of a rimmed baking pan or jelly roll pan (about 12"x16") and brush lightly with butter. Add three more stacks of two sheets (it's easier to pull them off the pile two at a time), brushing with butter between each. 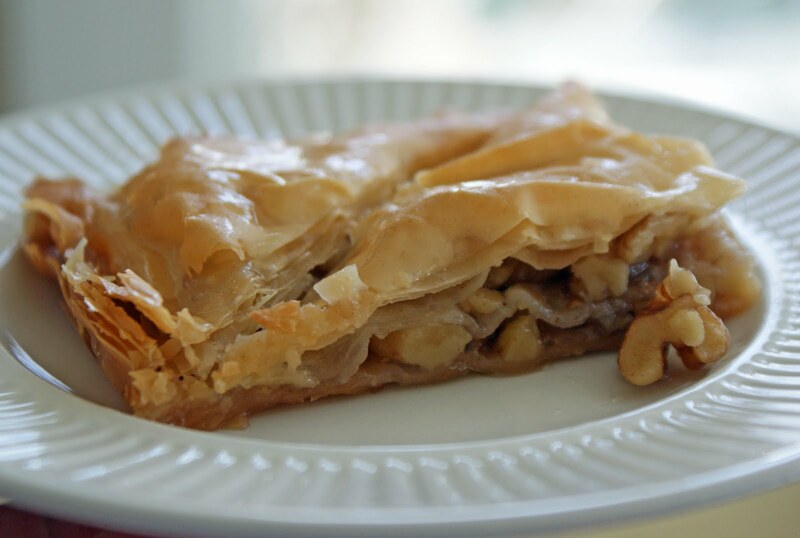 Once you have 8 pieces of phyllo, spread a third of the nut mixture overtop. 3Place 4 more sheets of phyllo on top of the nuts, brushing melted butter between each sheet or every two sheets. Repeat with another third of the nut mixture, another 4 sheets, and the rest of the nuts. Layer the remaining sheets of phyllo on top of the nuts; brush the top sheet with butter as well. Tuck in any sticking-out edges. 4Cut the pastry lengthwise into four strips, then crosswise into six, making 24 pieces (they don't have to be square), making sure not to slice through the bottom layer of phyllo. (This allows the syrup to soak in better.) Make diagonal cuts through each square, making them rectangles (you'll end up with 48). 5Bake for 20-25 minutes or until golden. While the baklava bakes, combine the sugar, water, honey and lemon peel in a pan set over medium-high heat and bring to a boil. Remove from the heat and take out the lemon peel. 6When the baklava comes out of the oven, immediately pour the hot syrup evenly overtop. Let the baklava stand at room temperature until completely cool. Slice through each piece completely before serving.